What's Left When a National Monument Is Reduced by 90 Percent? Utah Sen. Orrin Hatch’s office has been slowly trickling out details on the future of the Bears Ears National Monument. Central and Eastern Utah Director Ron Dean, who works underneath Hatch, told a commission in a meeting Tuesday he expects the monument’s 1.35 million acres to shrink to 100,000 to 300,000 acres. That’s nearly 90 percent of it gone, at worst, and about only 30 percent of it to stay, at best. However, this is exactly what the state envisioned when it demanded a scale back. Bears Ears isn’t the only Utah monument on the chopping block, though. So is the Grand Staircase-Escalante, the largest national monument in the United States, with 1.9 million acres under its belt. That title would no longer be true if it were reduced to anywhere between 700,000 and 1.2 million acres, as Dean indicated Tuesday. Dean noted his intel could be wrong, but if it were, “my rumors are bad rumors,” he said, per The Deseret News. Earlier this month, Hatch said that the monument will shrink, per a conversation with President Donald Trump. Sen. Hatch’s office wouldn’t confirm these numbers in an email to Earther. This latest hint at how much land the administration plans to actually remove throws the debate over Bears Ears back into the spotlight. The land received protection under former President Barack Obama back in December. Since then (but, really, way before that), the monument has been a major point of contention between state officials and their constituency. People like Hatch don’t want to see the land federally regulated. They argue the federal government is overstepping its executive power. Proponents of the designation, however, point to numbers that show the American public supports protecting Bears Ears. 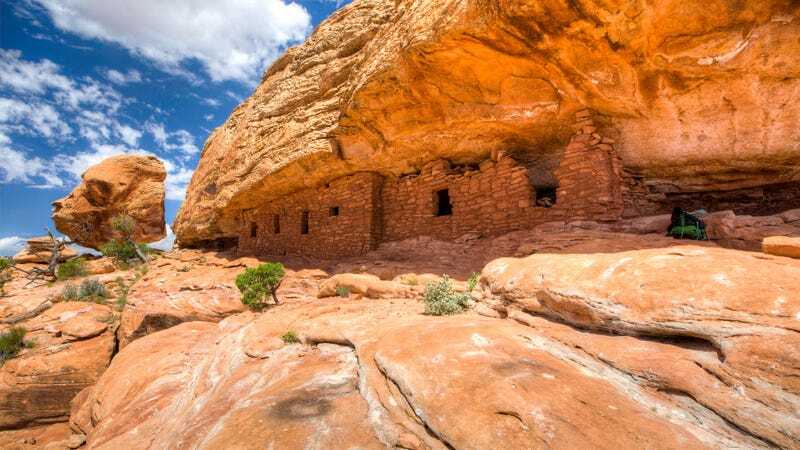 The Utah Diné Bikéyah, a Native American nonprofit that formed to help preserve the site, commissioned a survey in May that found 64 percent of registered voters in Utah want to see current protections remain. This survey polled a “representative sample of 500 registered voters in Utah,” according to the press release. Sovereign tribal nations have, for the most part, supported the land’s designation too. The 200+ tribal members of the National Congress of American Indians supported the monument in 2015. Since Trump has taken office, tribes have barely heard from him about this decision. “The fact that the administration does not meet with sovereign nations, it just doesn’t make sense,” said Cassandra Begay, the tribal liaison for PANDOS, a nonprofit that advocates around indigenous environmental issues, to Earther. Tribal leaders have written the president to no avail. Interior Secretary Ryan Zinke met with the Bears Ears Inter-Tribal Coalition in May, but that’s about all the interaction the tribal leaders have had with the administration. As for smaller tribes and bands? Nothing. For people like Begay, a Navajo woman who grew up near the land, Bears Ears is more than a beautiful, sprawling landscape of red, Mars-like rocks. It’s sacred. It’s home. It tells their story. Bears Ears is covered in petroglyphs from ancient times. Some cultural sites date back to 12,000 B.C.E. Tribal nations around today are related to those who lived in the dwellings that dot the cliffs—people like the Navajo, Hopi Tribe, or Pueblo Indians. A 90 percent reduction could, potentially, open up hundreds upon hundreds of thousands of acres of lands to fossil fuel extraction. That threatens not only sites with historical and cultural significance, but potentially, the 18 endangered species that call the park home, including the Mexican spotted owl and the California condor. In theory, that is supposed to take priority over local or state governments. So when Trump visits Salt Lake City in December, local indigenous opponents will meet him there. They’ve planned a rally for December 2 that will include speeches from tribal leaders, as well as some drummers and allies. They want to make a lot of noise. Because the issue is about more than land protection. It’s about indigenous rights, something Native Americans in the U.S. have been fighting for since time immemorial. In Utah, at least, they won this fight already. And, if they must, they’ll keep on fighting.